This picture is of my aunt in her primary classroom back in the early 1960s. How disciplined the young pupils look, don't they? I was reminded of this picture this week when I had a very different situation in one of my classes. We were working on a text in our English textbook and I had given the students prompts to discuss in small groups - with the noble intention of them having a chance to use and practise their spoken English and reinforce the vocabulary they were supposed to retain from the text. This is what I often do, believing that creating such activities fulfills my role as a good, learner-centred facilitator. On that particular day, I wasn't highly motivated myself, and to tell you the truth, actually found the text in our course book rather meaningless and boring. After guiding the students to start their small group discussion, I didn't go round the room listening to them, helping them or challenging them to think more in-depth, as I usually do, but used this time as a welcome break to sit down at the teacher laptop and (*blush*) check my Facebook account and email. After some time, I lifted my eyes from the computer screen to see how the students were doing. I had been hearing a steady murmur from the class, proof enough, I thought, that my students were getting on with the given task. Not this time, though! In one corner, 4 students were happily talking about their escapades of the previous weekend - in Finnish of course. On the other side, another group was busy sharing some shoe string licorice. At least 3 students were texting friends and one boy was lying on his desk, half asleep. I couldn't help bursting into laughter. Taken by surprise, all the students started staring at me, which then led to a good discussion about the absurdity of the situation. Can I blame them? Of course not. After all, I had myself been distracted, just like them. This would never have happened in my aunt's classroom, where she was the unquestioned authority that many students were surely intimidated by. 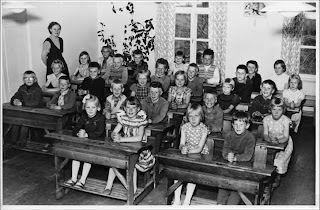 In those days, classes were also almost totally teacher-centred and top-down. No pair discussions or group work, as far as I remember. Back then, no student would have dreamt of questioning anything the teacher dictated. Luckily, education has come a long way, and now there is an ongoing negotiation between students and teachers in class. But how about actual learning, if the type of focus on task I witnessed this week is more the rule than exception? Interestingly, similar problems seem to prevail from Finnish high schools to American universities. Is it us teachers? Is it the institutions? Is it the traditional tasks and structure of our institutions? How to stop the wasted time of 'just getting by'? I agree with Dr. Wesch. Whenever I feel giving assignments in class just because they happen to be printed in a textbook, despite feeling bored enough myself to just go through the motions, I'd better throw away the book and start looking into 'the real world' for more meaningful learning experiences.